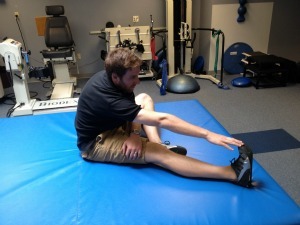 Specific Golf Stretches To Perform At Home To Improve Your Flexibility. 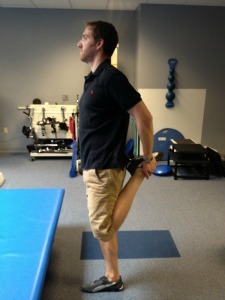 Looking for some specific golf stretches for the entire body to help improve flexibility? 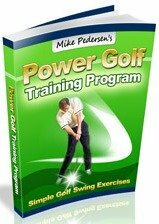 This page is dedicated to just that, larger muscles groups, more advanced stretches to target many of the key muscles and areas that are utilized during the golf swing. If you have browsed my golf warmup page, you read about a basic stretching routine that can be performed on the course prior to your round. The golf stretches on this page could also be added to that routine, but some, especially the back stretches, are easier to perform laying on the floor of your house than at the course. This list is intended to give you a few ideas of stretches to perform. Do you need to perform every single one in order? Definitely not, but at least you have a reference of some basic flexibility exercises. 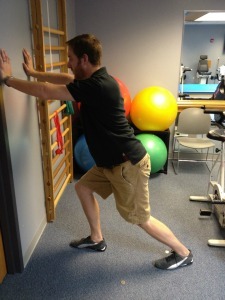 A golf fitness program should not only focus on strengthening! Improving your range of motion and ability to move will help with all aspects of your game. 1. Lower Trunk Rotation - Lie on your back in a hooklying position (knees bent with feet on the ground) and with knees and feet together. Gently roll both legs to the right and hold for a few seconds. Then roll legs to the left and hold. 2. Double Knee to Chest - Lie on your back in hooklying position. Take both knees and pull them towards your chest and hold with your hands. Hold 10 seconds. 3. Prone Press Up - Lie on your stomach and press your upper body up with your hands. Hold 10 seconds. 4. Child's Pose - Start on the ground on all fours. Rock backwards and sit on your feet with head tucked in. Hold 10 seconds. 5. Cat Stretch - Start on all fours. Tuck your head down and round off your back. Then tilt head up and transition to and extended back position. 1. 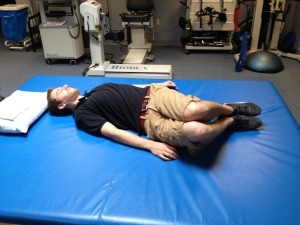 Piriformis - Lie on back with knees bent. Place right ankle onto left knee and grab your left thigh with both hands. Pull left knee to chest. You should feel the stretch in your right buttock. Hold for 10 seconds. Repeat by crossing left ankle onto right knee. 2. Hamstring - This is one of many variations of this stretch. Sit on the ground with right leg straight and left knee bent (left foot touching right knee). Reach forward for your right foot. Hold 10 seconds. Switch legs and stretch your left leg. 3. Quadriceps - Standing upright, grab your right knee and pull it towards your buttock. Hold. Repeat on the left side. 4. 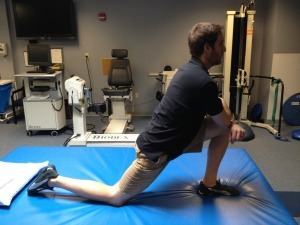 Hip Flexors - Start in half kneel, kneeling on right and with left foot in front. Shift weight forward onto left leg, feeling a stretch in front of the right hip. Hold 10 seconds. Repeat on left side. 5. 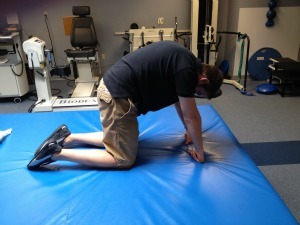 Hip Adductors - Sit on ground with knees bent and bottoms of your feet together. Grab your feet with your hand and lean forward. Hold 10 seconds. You should feel the stretch in your inner thigh. 1. 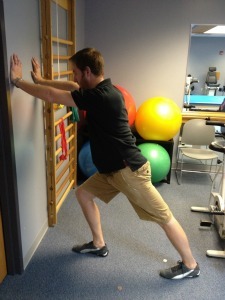 Gastroc Stretch - Stand facing a wall. To stretch the right, have right foot back with knee straight and with heel flat on ground. Left knee can be bent. 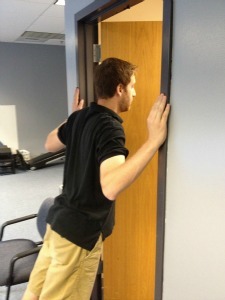 Put hand on the wall and lean forward, feeling the stretch in your calf. Hold 10 seconds. Switch sides. 2. 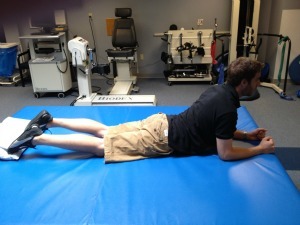 Soleus Stretch - Same motion as gastroc stretch, except the knee of the back leg is slightly bent. 1. Doorway/Corner Stretch - Stand either in a corner of a room or in a doorway. Place hands at about shoulder level with elbows bent. With feet together, slowly lean forward, feeling a stretch across your chest. Hold 10 seconds. 1. 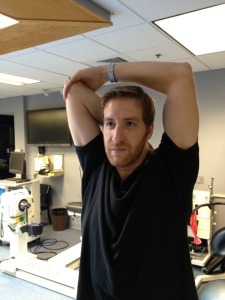 Posterior Capsule - With arm at shoulder level, reach across your body with right arm. Grab the back of your right elbow with left hand and further pull to the left. Hold 10 seconds. Switch sides. 2. Inferior Capsule - Raise right arm overhead. Bend elbow and place right hand on the base of the back of your neck. Reach over your head with the left arm and grab the back of your right elbow and pull gently to the left. Hold 10 seconds. Switch sides. 1. Tennis Elbow Stretch - Start with right elbow bent and grab right hand with left and hold into a flexed position (fingers to the ground). 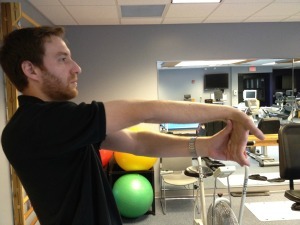 Keep wrist in this position and slowly straighten elbow until a stretch is felt in the forearm. Perform three times and hold each 10-15 seconds. 2. 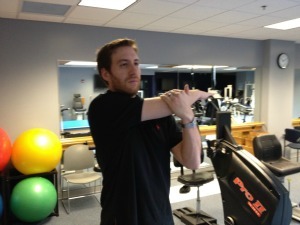 Golfer's Elbow Stretch - Similar to tennis elbow stretch but hold wrist in extended position (fingers to ceiling). 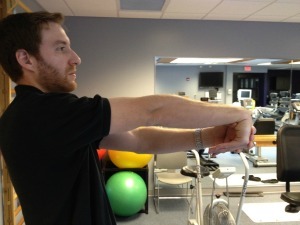 Slowly straighten elbow until stretch is felt in forearm. Perform three times and hold each 10-15 seconds.